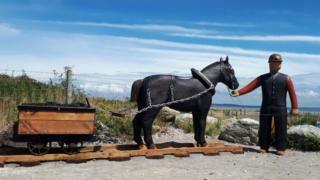 A new sculpture remembering the pit ponies at a Flintshire colliery has been unveiled. Point of Ayr, near Prestatyn, was the last remaining deep pit in north Wales when it closed in 1996. Coal was mined from beneath the seabed there for more than 100 years. The colliery was one of the last to be mechanised and pit ponies were used until 1968, with four underground stables housing around 70 animals. The average working life of a pit pony was 20 years and they were trained on the surface to get them used to the rattling of chains. "Driving the ponies" was often the first job given to young miners and many formed close bonds with their pony. Retired miner Glyn Hughes, from Gronant, said: "My horse's name was Turpin. On my first morning, I went 'gee up horse', and he wouldn't move. "The old collier said to me 'Glyn, it's no good, they don't understand English. You'll have to learn Welsh and speak Welsh to them.' So that's why I started learning my Welsh. I had to speak Welsh to the pit ponies." The unveiling of the sculpture - created by local artist Mike Owens, whose own grandfather was a miner - was part of an open day celebrating the history of the colliery. A £40,500 Heritage Lottery grant has helped fund a project to preserve the mine's legacy, including a miners' trail and circular walk using the Wales Coast Path between Ffynnongroyw and Talacre. A new app for the trail, with images and audio, was also launched on Sunday. John Wiltshire, chairman of the Point of Ayr Community Heritage Group, said: "We are all really excited to bring the mine back to life and to educate both local people and visitors about the mine's importance, not just locally but also to the heritage of Wales as a whole."